K. Kuh, "Joseph Cornell in pursuit of poetry," Saturday Review, vol. 2, no. 25, September 6, 1975, p. 38 (illustrated). "Cornell's romance with time was complicated," Lynda Roscoe Hartigan has explained. "He did not date most of his works, yet obsessively recorded dates and times in his diaries as he commemorated the mundane details of his daily life and the ebb and flow of his thoughts as an artist. The fragmentary and the distilled, the elastic and the specific are dualities that he regularly confronted in his personal journey to balance his fascination with the past and his desire to interpret 'presence' as a tangible quality in his art. Time's measure, phases, and patterns loom in his work, whether in the direct use of clock parts and imagery or the suggestive presence of sand" (L. R. Hartigan, op. Cit., p. 335). 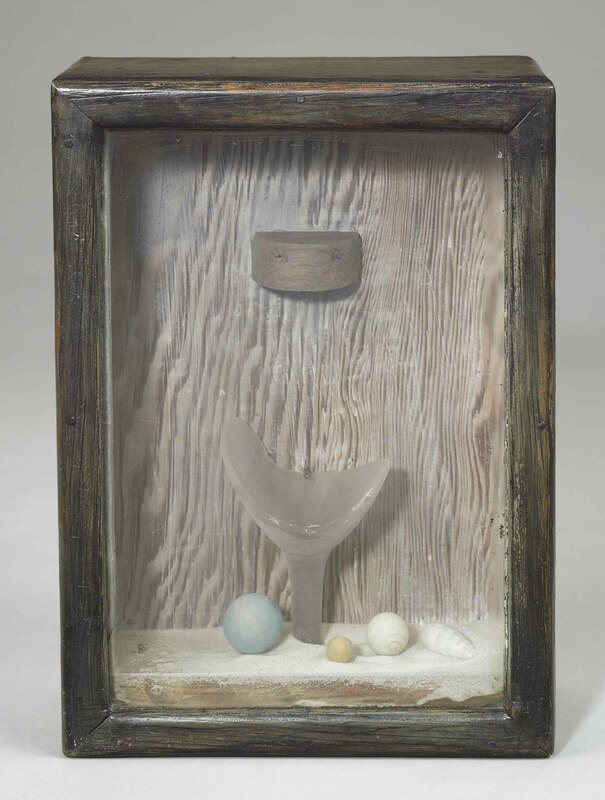 Perhaps the most difficult of Joseph Cornell's work to fully appreciate through reproduction, the full beauty of the Sand Fountains is not entirely evident until, like an hourglass, the box is activated. A miniature theater of time, the ceilings of each Sand Fountain mask a hidden chamber. When the box is gently turned upside down, the sand is driven into the hollow. Resuming the box to its upright position starts the flow of sand out of the concealed compartment, running like an hourglass for an exact interval of time, as the sand steadily cascades into a shattered cordial glass and then spills over onto the floor of the box. Seemingly simple, Cornell's device is analogous to an ordinary sand-timer-for which he had several extraordinary examples lining the shelves of his basement studio. And yet, each Sand Fountain encapsulates infinitely vast words of complex ideas. As if to capture eternity in a Woolworth goblet, the Sand Fountains are a testament to time's character as not only cyclical, but also fleeting. Allowing time to pass before we know it, the flowing sand mesmerizes its viewers. And yet, time never "runs out" in the Sand Fountains, which manifest themselves as chambers of time in motion as soon as their contents are recycled and the operation is repeated. Echoing the age-old idiom that "history repeats itself," repeat activation of Cornell's Sand Fountain causes each individual work to produce nearly identical formations within their unique box. Thus, while these enthralling constructions resemble hourglasses in their display of cycles and intervals, they do not function as measurements of time, but instead invite us to contemplate the transience of time. Nineteenth-century traveler's memoirs, guidebooks, and photographs informed his impressions of 'the light of other days,' a phrase that recurs in his diaries. The results are convincing evocations of the character of a place or period. Even as he struck timeless notes of charm and nostalgia, the use of weathered or old-fashioned materialsconvey hints of aging. A strong sense of the present emanates from Cornell's efforts to capture 'fleeting impressions' and the 'spontaneous unfoldment' of images, while his emphasis on childhood and memory represents his belief in extending the past into the present and the future. Ultimately, his descriptions of time as 'eterni-day' and the 'metaphysique d'ephemera'-the lasting and passing-reflect his estimation of time's multiple dimensions and effects in his projects of beauty and insight (Ibid. ).